I founded INFERNAL POETRY in 1996, and i never left the band. At the very beginning i was singer/guitar player, but starting from 1998 i focused on my 6 strings because we needed more reliable vocals. This page is in English only. 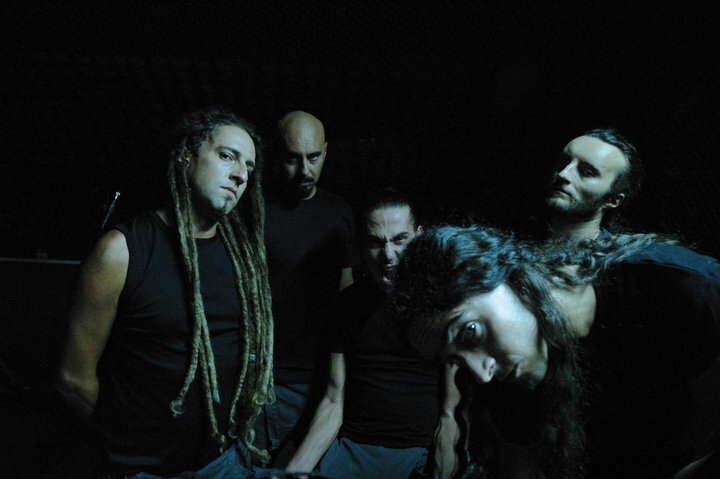 Born in Ancona (central-west Italy) in 1996, INFERNAL POETRY is considered to be one of the most important and original extreme acts in Italy. An incessant live activity all over Europe (with Dismember, Rotting Christ, Impiety, Behemoth and many more) was the key to earn the name of ‘Killer Live Act’ and to step out the deepest Italian underground. Starting like a mix between American brutality and Swedish melodies, INFERNAL POETRY’s sound is now evolving into something new and refreshing, with disturbing tones and schizophrenic elements. Media from all over the world are labelling their sound ‘Schizo Death Metal’. After the cult debut NOT LIGHT BUT RATHER VISIBLE DARKNESS (2002), the masterpiece BEHOLDING THE UNPURE (2005) and the shocking Ep NERVOUS SYSTEM CHECKING (2007), the band released in 2009 the worldwide acclaimed NERVOUS SYSTEM FAILURE, one of the most schizophrenic, hysterical and grotesque album ever. The last album, called PARAPHILIAC, was released on january 14th 2013…by the way, once again, in my birthday (it already happened for the debut album in 2002). PARAPHILIAC release was followed by a European tour in Croatia, Bosnia, Serbia, Hungary, Bulgary, Romania in october/november 2013. The album got once again incredible feed backs in many countries, but in the first months of 2014 we decided to kill our creature. The circle was done. INFERNAL POETRY died on april 2014. You can still visit the facebook official page at www.facebook.com/infernalpoetry and leave your farewell message.